POOL LINERS AVAILABLE IN 20-GAUGE, 25-GAUGE, & 30-GAUGE SUPER-STRONG VIRGIN VINYL! In the Swim's 24 foot round overlap pool liners will provide you with outstanding durability as well as attractive style. These above ground overlap pool liners are designed to be secured under your pool's top rail. 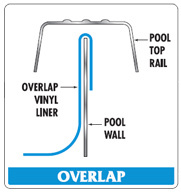 The fabric of overlap pool liners is draped over the pool's walls and held in place with clips. The top rail is then placed over top of the liner. Our 24 foot round overlap pool liners are available in a number of stylish, eye-catching designs including a boulder swirl pattern, an aquarium pattern and a Caribbean pattern. These overlap pool liners are also available in solid blue. Our 20 gauge liners are backed by a 15 year warranty. Our 25 gauge liners are backed by a 25 year warranty. Our 30 gauge liners are backed by a 25 year warranty. Constructed from super-strong virgin vinyl for exceptional durability. Double welded seams for rugged construction and superior resistance against wear and tear. Will resist fading and damage caused by harsh weather and UV radiation from the sun. 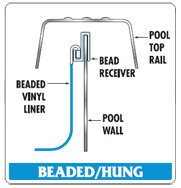 Beaded style liners have a bead around the top edge of the liner that is snapped into a bead receiver track all the way around the top of the pool wall, securely holding the liner in place. Overlap style liners are draped over the top of the pool wall and held in place with plastic liner coping strips. Once the top rails are reinstalled, the excess liner on the outside of the pool can be trimmed off.